As bad as this movie is you cannot but love it if you are a mecha (or giant robots) and a kaiju fan — which I am. There’s plenty of action (although not very realistic and playing loose with the laws of physics), not much story, a hint of human drama, and a bit of humour. There’s not much originality either, but let’s call it an “hommage.” The term Jaeger reminds me a little of Heavy Gear (although it could come from so many other sources: it means hunter in German, could refers to infantry troops, a bird, a car, or several anime or manga), some designs seems inspired by many giant robots anime (Giant Robo, Mazinger, The Big O) and, of course, the kaiju part if inspired by Ultraman, Godzilla and Gamera, but the biggest “influence” is without contest Neon Genesis Evangelion — and this is probably the closest we’ll ever get to an Evangelion live-action movie. The alien monster attacking Earth, using alien technology to develop weapon against them, the synchronization part, the tall slender design similar to the rogue jaeger Obsidian Fury (damn! I love that design! ): that’s seems all “inspired” by Evangelion. Although they’ve gutted all the really interesting stuff (mystical bits and human drama) it is still pretty entertaining. There is plenty of cool stuff in this movie. No transforming robot but instead a combining kaiju. Not a bad idea. And I’ve certainly LOL when the pilots of Bracer Phoenix have to eject and land at the feet of a statue of a… Gundam! Beautiful and really funny. I couldn’t fail to notice the heavy Chinese presence in the cast and crew (not surprising since producer Legendary was bought by the Chinese Wanda Group and some of the shooting was done in a studio in China). It did relatively well at the box office but was not particularly liked (rating of 5.6 on IMDb and 44% / 41% on Rotten Tomatoes !). 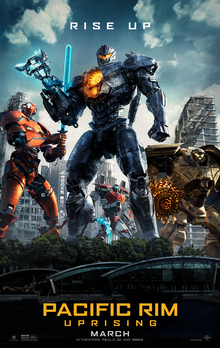 All in all, it offers brainless sci-fi action and lots of mecha & kaiju nostalgia. If you are a fan.